Yootech Galaxy S6 Edge Screen Protector features exceptional clarity and UV protection to prevent yellowing. It is made from the same protective film material used to protect military aircrafts, helicopters and space shuttles. also equipped with "self-healing" properties to maximize the protection. The self-healing technology works to constantly eliminate minor scratches on the film. All of our Screen Protector are uniquely designed to provide a perfect cut for a perfect fit on your device. It also features corrosion and moisture protection to prevent substances from migrating through the film to attack underlying substrates. It's designed to provide daily protection against scratches and reduce chances of damage to your screen from impact forces and drops. Best of all, it's very easy to apply. At Yootech ,we promise a lifetime warranty with our screen protector. No matter how long you've used it, we'll make a REPLACEMENT OR FULL REFUND. Compatible with Samsung Galaxy S6 Edge. Laser cut designed specifically to offer maximum screen coverage. Material flexibility allows total coverage even on curved devices. Flexible and Tough, Military Grade Material Designed ensures that your device is protected at all times from Daily Scratches,Dust,Scrapes,Oil&Fingerprint Smudges, and Normal Signs of Wear. High Response Sensitivity, Scratch-proof, UV resistant, puncture, and non-yellowing. 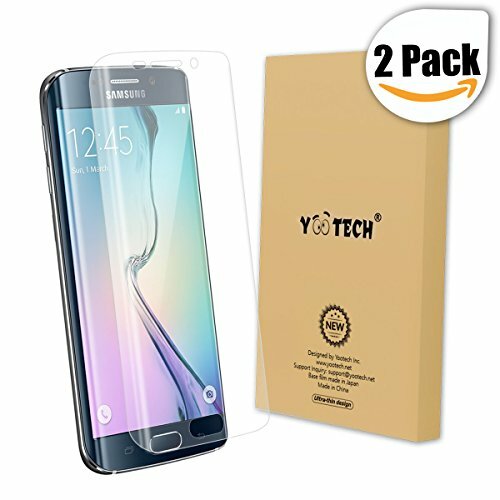 What You Get: Yootech Galaxy S6 Edge Screen Protector[2-Pack],welcome guide,Lifetime warranty and friendly, easy-to-reach customer service.